SRINAGAR, India/MUZAFFARABAD, Pakistan (Reuters) - As India and Pakistan seemingly dial down hostilities that brought the arch enemies to the brink of another war, a massive crackdown on militancy in the Indian-controlled Kashmir region is killing both militants and security personnel in big numbers. At the Line of Control (LoC), the de facto border between the nuclear-armed neighbors, there was relative calm in the past 24 hours, their armies said on Sunday. The exchange of fire in the past few days has killed seven people on the Pakistani side and four on the Indian side, though the release of a downed Indian fighter pilot by Pakistan on Friday night has helped de-escalate tensions. 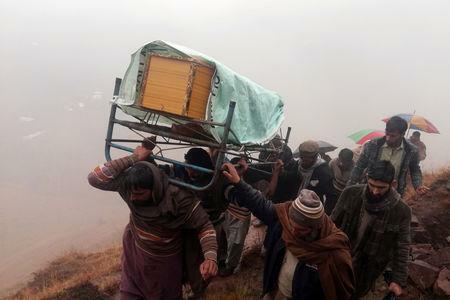 "By and large the LoC was calm last night but you never know when it will become active again," said Chaudhry Tariq Farooq, a minister in Pakistani Kashmir. "Tension still prevails." Indian warplanes carried out air strikes on Tuesday inside northeast Pakistan's Balakot on what New Delhi called militant camps. Islamabad denied any such camps existed, as did some villagers in the area when Reuters visited. Nevertheless, Pakistan retaliated on Wednesday with its own aerial mission in a show of force. The countries have fought three wars since independence from Britain in 1947. In Indian-ruled Kashmir, troops on Sunday shot dead two militants after a three-day gun battle that also killed five security force personnel, taking the total death toll to 25 in the past two weeks. The fresh anti-militancy drive was launched after a Kashmiri suicide bomber, a member of a Pakistan-based militant group, killed 40 Indian paramilitary police on Feb. 14. The government of Prime Minister Narendra Modi has also come down hard on separatist groups operating in Kashmir, including by banning the Jamaat-e-Islami party, two of whose clerics were detained in raids on Saturday night. On Sunday residents observed a shutdown in South Kashmir's Tral area against the detentions. Shops were closed and traffic was off the roads in the area, and a protest march took place. Indian authorities have arrested more than 300 Jamaat leaders and activists in the past two weeks, accusing the group of supporting attempts to "carve out an Islamic State out of India" by destabilizing the government. Amit Shah, the president of India's ruling Hindu nationalist Bharatiya Janata Party that faces a general election by May, told an election rally that the government has made it clear to the separatists that "if they want to live in India, they will have to speak the language of India, not Pakistan's". The government, however, has come under pressure from the opposition to share proof that "a very large number" of militants were killed in air strikes inside Pakistan this week, after doubts were raised there were any casualties in the attack. Finance Minister Arun Jaitley, one of Modi's top lieutenants, said on Saturday "no security agencies ever share operational details" and dismissed suggestions that the escalation in tensions with Pakistan had anything to do with domestic politics ahead of the election. Pollsters expect the ruling party to benefit from the nationalistic passion sweeping the country.